Business Intelligence provides sales and marketing teams with the information and insight they need on customers, prospects, markets and competitors. With powerful dashboards, analytical and reporting solutions sales and marketing teams are able to better and more accurately track, monitor and analyze every aspect of a sales cycle. BI makes it easier to identify cross-selling opportunities, locate profitable customers, track competitors, and create strategies to successfully reach sales quotas and revenue goals. With the addition of RangeFinder, you can make it even easier to visualize how your company is doing compared with historical data as well as your competitors to make educated and informed decisions that will enhance your company’s future. In the example below, we are looking at quarter-to-date sales numbers for all salespeople in a company. 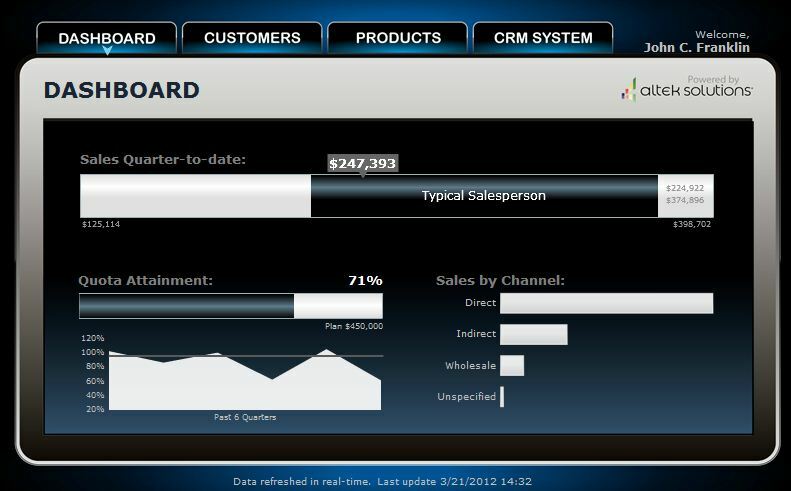 RangeFinder is utilized to visualize the typical sales numbers for the current quarter and compare it against the sales numbers for the person that is logged into the dashboard. This will allow for salespeople within the company to see how they are doing in the current quarter compared to their peers. Download a fully-functional watermarked copy of the software free for your evaluation to discover how RangeFinder impacts the way you present and visualize information. Get the 30 day free trial here!